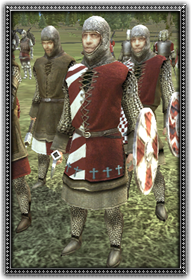 Literally meaning 'house man', Huscarls are the loyal household troops of Scandinavian nobles. Protected by mail armour and wielding axes, they resemble the Vikings of old, especially when they fight on foot. Brave and fierce, with their axes, mail and shields they make excellent infantry.